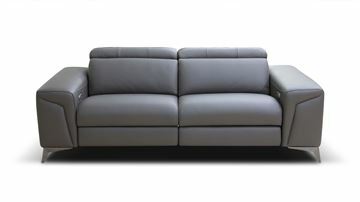 The Bracci Tessa is a tremendously comfortable reclining sofa design. The sleek track arm is softened by the tailoring detail, giving it a graceful appearance. The generous back cushion works in perfect unison with the fully adjustable electric controlled head rest and leg rest, giving you luxurious comfort. Please click on the DESCRIPTION tab below for all the details. Made in Italy. 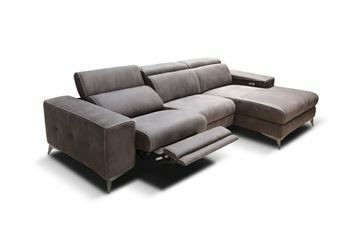 Power motion sofas and sectionals. Features a unique inset beveled arm. Luxuriously comfortable. In the realm of quality and Italian design, the Bracci Mara Reclining Leather Collection showcases the harmony of creativity and function. The key design element of the Mara is the unique bevel that is tailored into the front arm panel. The collection is available in many different sizes and cover choices. The head rest and leg rest, both fully motorized, operate independent from one another. This gives you maximum flexibility to find the perfect position to relax. Also available are three different leg finishes, and four different stitching styles made to suite your preferences. 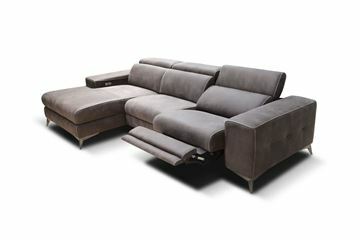 In the realm of quality and Italian design, the Bracci Emma Reclining Leather Collection brings both together in harmony. 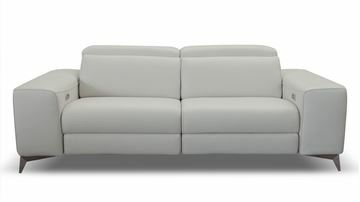 Design flare is shown with beautiful side panel tufting and a soft radius accent seam on the arms. The quality of materials used by Bracci are, quite simply stated, exceptional. The collection features fully motorized reclining mechanisms. And for added customized comfort, the head rest and leg rest operate independent of each other. Each can be adjusted anywhere between fully closed and fully opened, and will hold any of the positions you stop it in thanks to the electric mechanism. This unique control system allows you to adjust the leg rest and head rest until you find that perfect spot of proper head support and relaxing position for your lower body. Sometimes you want your legs fully supported and your upper body perched in a more upright position. Sometimes you want to recline fully and have your head slightly raised to watch TV. With the Emma design, you can find the perfect spot to just relax, any time, and enjoy a bit of life's simple pleasure. Select from a variety of sized sofas, love seats, and sectionals, all made to order in a leather covering that perfectly matches your desired comfort level and lifestyle.